Ziarah (Pilgrimage, 2016) from film director B.W. Purwanegara is a metaphor for Indonesia’s contemporary historical discourse. 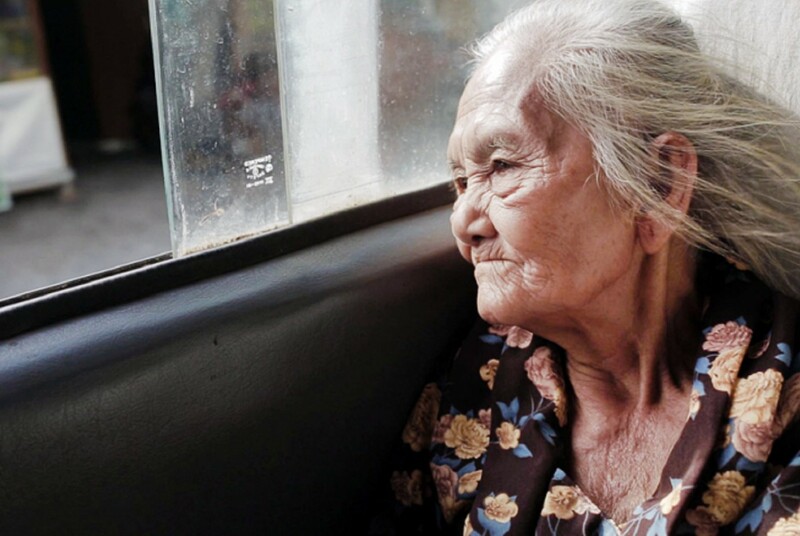 At 83 minutes, Ziarah is a long and winding story centered on a senescent 95-year-old woman named mbah (grandmother) Sri (Ponco Sutiyem) and her grandson, Prapto (Rukman Rosadi). Prapto is about to propose to his girlfriend through her father. He considers it inappropriate to go alone to make the proposal and therefore, he wants to bring his grandmother with him. However, a problem ensues when Prapto’s grandmother suddenly goes missing without any notice. He believes that she has gone to find his late grandfather’s grave. Sri has no idea where the grave is but she is determined to find it because she senses that her final days are coming and her last wish is to be buried right beside her husband. Sri only knows that her husband was a fighter during the Dutch colonization period and that he disappeared under mysterious circumstances. Whether he passed away during the Dutch occupation era or outlived the colonization remains unclear for Sri. Prapto who is now looking for Sri also has no clue as to where his grandfather’s grave is. He depends on sketchy directions from other people to find the grave. The film’s narration then moves to new territory, exploring conflicting accounts of Prapto’s grandfather; was he a traitor or a hero? Did the Dutch kill him or not? Did he survive? And if he has passed away, where is his grave? Some locals are even unsure about Prapto’s grandfather’s real name. As a result, both Prapto and Sri lose their way and wander aimlessly throughout the story. There is one instance when a local deliberately gives Sri wrong directions, causing her to stray from her mission of finding her missing husband’s grave. Apparently, the local gives her incorrect directions in order to “protect” her from the ultimate ugly truth that she has to deal with in the end. Although forming a complete story arc, this slow-paced film should also be interpreted as a metaphor illustrating the realities faced by Indonesians today in terms of how we comprehend our history. Observers have often described Indonesians as being ahistorical due to our poor understanding of our past. In schools, history lessons merely require students to memorize facts and figures related to the government’s official version of events, only to be forgotten shortly after the students have completed their examinations. It is fair to say that this idea is conveyed through locals who forget details about the life and death, even the actual name, of the “hero” in question. Competing versions of events as told by locals also appear to confuse both characters. This confusion reflects our inability to differentiate truth from propaganda because our history curriculum has never taught us how to compare and contrast different historical theories and pick which one makes most sense. Finally, Sri’s desire to rest in peace beside her husband after his mysterious disappearance seems to act as a metaphor for Indonesia’s difficult journey to come to terms with its own dark past. References to the 1965 tragedy as well as human rights violations during the New Order era, including the drowning of villages to create dams, feature prominently in the film. The character who deliberately sets Sri on the wrong route is the embodiment of government authorities who always shut down discussions of our own dark past in order to steer us away from the painful and ugly truth. In the real world, Indonesians are very familiar with how the government has continually tried to manipulate the past by not telling the whole truth and sometimes, by even blocking access to information altogether. Discussions, film screenings and plays related to the 1965 tragedy have been banned, sometimes through force by mass organizations and vigilantes. All the while, posters telling us about the now-defunct Indonesian Communist Party’s (PKI) latent danger and evil are scattered everywhere, reminding us of the propaganda used by the New Order to legitimize their repressive authority for three decades. The question for Sri is also relevant for us Indonesians: are we ready to confront the ugly truth? If yes, how are we going to respond to it? What are we going to do about it?